Customer Reviews | Rate Us Today! Alaska Mining & Diving Supply, Inc. The agile, powerful and effortless Summit SP is built around the rider more than ever before to make even the most technical boondocking easier for riders of every ability. Rotax® 850 E-TEC® engine: Next generation of the most advanced direct-injection two-stroke engine technology. 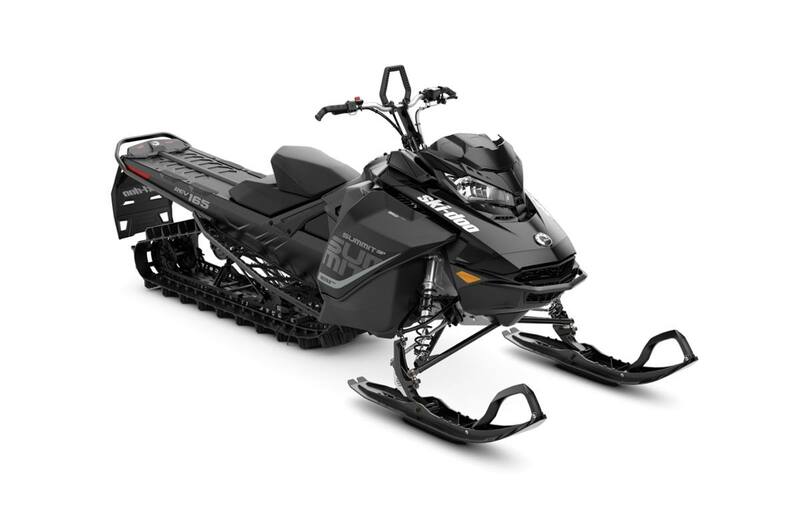 Designed for reliability and durability with proven 4-stroke and diesel technologies. Summit Ergo-Step side panels: Rear section of the panels are ergonomically shaped to support the rider’s shins on downhills. Narrow profile and shape at bottom minimizes “paneling out” in sidehilling. Bottom pan is shaped for flotation in carving and sidehilling. pDrive™ clutch: Fast and friction-free dual rollers transfer torque in place of traditional sliding buttons on this 100% new clutch. Ultra-responsive shifting, impressive RPM consistency and lightweight. tMotion™ suspension: A swiveling rear arm and split front arm allow the skid to flex laterally for more predictable carving. More rising-rate motion ratio adds capacity and comfort. Drive sprocket diameter: 166 mm / 6.5 in. Vehicle overall length: 3,555 mm / 140 in. Vehicle overall width: 1,080 to 1,110 mm / 42.5 to 43.7 in. Vehicle overall height: 1,359 mm / 53.5 in. Ski stance: 907 mm or 950 mm / 35.7 or 37.4 in. Ski overall length: 1,040 mm / 41 in. Track nominal width: 406 mm / 16 in. Track nominal length: 4,178 mm / 165 in. Front suspension max. travel: 215 mm / 8.5 in. Rear suspension max. travel: 239 mm / 9.4 in. Riser block height: 165 mm / 6.5 in.